With Avengers: Infinity War being arguably both the best and the most complicated film in the Marvel Cinematic Universe so far, it’s only expected fans are still coming up with theories and analyzing every scene nearly a year after its release. And with the final chapter in the Avengers series expected to answer basically all the questions we have about our favorite heroes, fans are now passing the time until it hits theaters with binging of the films. One fan on Reddit seemingly did just that, and realized something potentially major. User CleverD3vil took to the platform to share his discoveries after analyzing one of Doctor Strange’s scenes in Infinity War. 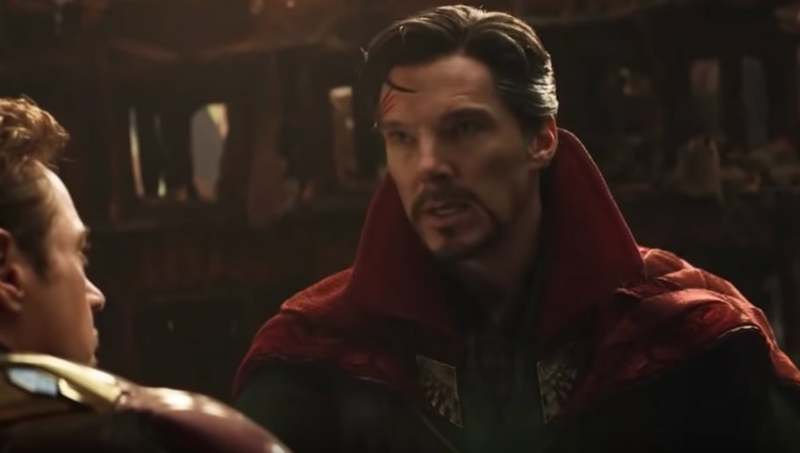 The fan believes after some assumptions and calculations that Strange was actually in a roughly 5,000-year time loop when looking at all the possible outcomes for the Avengers. Here’s how. The scene in question, as fans will remember, sees Strange look forward in time 14,000,605 times, in order to find every possible scenario in which the Avengers face off Thanos. Benedict Cumberbatch’s character then tells Iron Man that there is only one future where the heroes win. The dedicated Redditor took this scene and theorized that if Strange was to watch every possible scenario, he would have—at the very least—had to watch all of the events that went down in Infinity War. If you take the movie's three-hour runtime and multiply it by that 14,000,605 number, that would give Strange more than 42 million hours of scenarios to review. Since there are 8760 hours in a year, that would mean that Strange spent roughly 4,795 years just viewing the possible outcomes. (The fan rounded that total up to 5,000 on Reddit.) That's a lot of years, and a lot of time for Doctor Strange to work out how to best use his powers to help fight Thanos. The fan argues that all of this time spent looking into the future would’ve likely increased Doctor Strange’s powers and his experience using them. “In those 5000 years he would have learned a s**t ton of things and this is how he could even put up a fight with Thanos with different kind of powers and specially [sic] without the stone,” the Redditor writes. doctor strange was willing to spend an eternity dying to keep the earth & the people on it safe. doctor strange saw himself, his friends & his world die 14 million times. he knew he was going to vanish, but he did it bc it’s going to save the world in the long run. he’s selfless. Although Doctor Strange ultimately disintegrates at the hands of Thanos’ snap in Infinity War, we’re assuming we’ll see him again come Endgame. If this theorist is onto something here, perhaps Strange could be ready to use his powers once more in the next inevitable battle against the Mad Titan.